More enticing than fruit and more exciting than flowers, fine chocolates are gathered together to create a delicious bouquet, perfect for celebrating a special occasion. Send hugs & kisses this Valentine's Day! This adorable "bouquet" of Lindt Strawberries and Cream truffles, Hershey Kisses and Italian chocolate hearts, beautifully arranged in a vibrant container. One BonBon Blooms™ Hearts Bursting Bouquet. Box Measures 12" x 12". 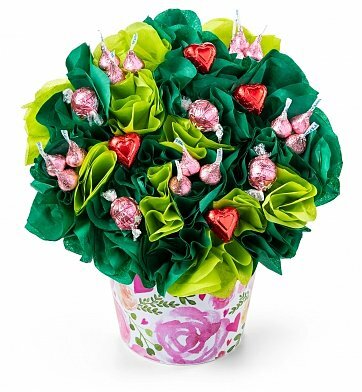 BonBon Blooms™ Hearts Bursting Bouquet is a hand delivered gift. These gifts are delivered by one of our local design centers located throughout the United States and Canada. Same day delivery is available for most gifts when ordered before the cutoff time. The cutoff time for BonBon Blooms™ Hearts Bursting Bouquet is 1 PM in the recipient's time zone. 30 creamy chocolates including Lindt Strawberries & Cream truffles. Beautifully arranged to resemble a bouquet in a floral container.